Hint: It's Tesla! Here are several auto charts you need to check out before you trade. It's been a tough year so far for carmakers. Year-to-date, the Nasdaq OMX Global Automobile Index, which tracks a basket of the most liquid automakers in the world, has shed more than 12% of its value. That's a stark contrast from the S&P 500 , which has charged about 9% higher on a price basis over that same time frame. 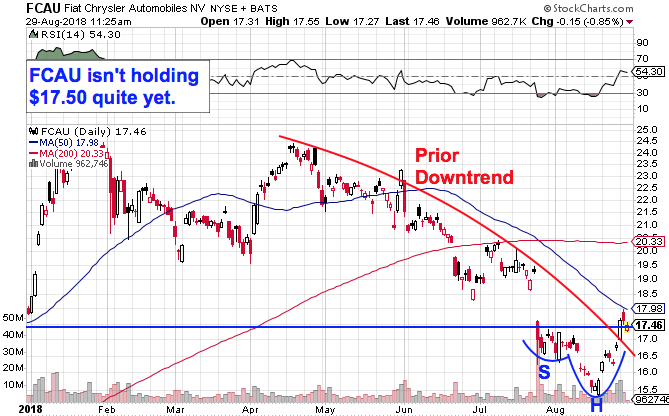 The good news is that auto stocks are finally starting to show some signs of a positive reversal here. In short, carmakers could be about to play catch-up with the rest of the market this fall. Interestingly enough, the best-looking stock in the group from a technical perspective is the one with the strongest bearish sentiment right now. To parse out what that all means - and what to do with this publicly traded U.S. carmaker, we're turning to the charts for a technical look. We'll start things off with shares of Ford Motor Co. (F .
Ford has been an awful performer in 2018, shedding about 16.2% of its market value since January once dividends are accounted for. But after that prolonged selling, Ford finally looks as if it's carving out a reversal here. Shares broke out of their well-defined downtrend just a few sessions ago, pushing toward a key breakout level in Tuesday's session. 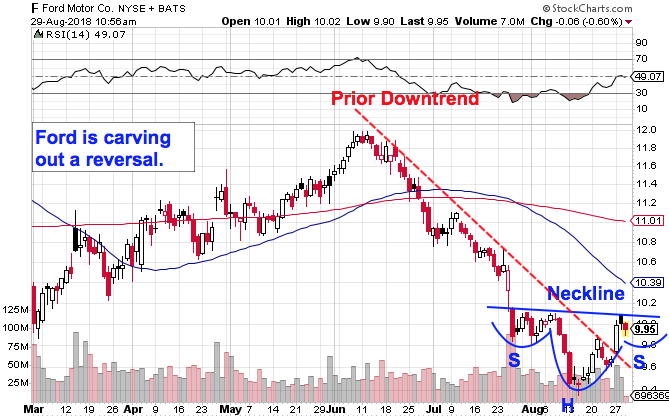 Since the end of July, Ford has been forming a pretty textbook example of an inverse head-and-shoulders pattern, a bullish reversal pattern that often shows up after downside. The breakout signal comes with a material push through the $10.10 level, a price level that's acted like a ceiling for Ford on its prior tests of a move higher. Like Ford, Fiat Chrysler is trying to carve out a reversal after a prolonged selloff that started this spring. For this stock, the breakout level is $17.50. Shares briefly attempted to push through that level this week, but they faded after being swatted lower around $18, and Fiat Chrysler is back below $17.50 now. That's not necessarily a cause for concern for this stock's ability to pull off a change in trend here, but it does signal that some patience may be needed for it to play out. The price action in GM here is about as straightforward as it gets: Shares are pulling off what looks like a confirmed breakout from its downtrend this week. GM's big bullish candle on Monday is a strong signal that buyers are stepping in at these lower levels in a meaningful way. That said, it's a little too early to call GM an outright buy at this point; it's just not a train wreck any more. 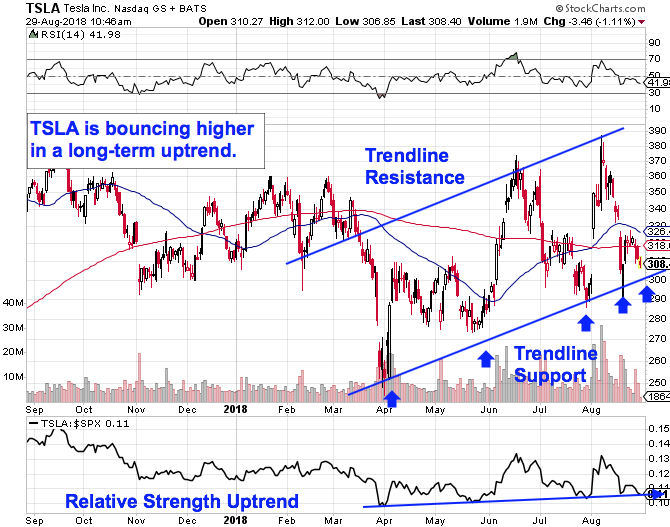 Relative strength continues to be in a downtrend, indicating that GM is still underperforming the rest of the market here, even in spite of its recent technical achievements. 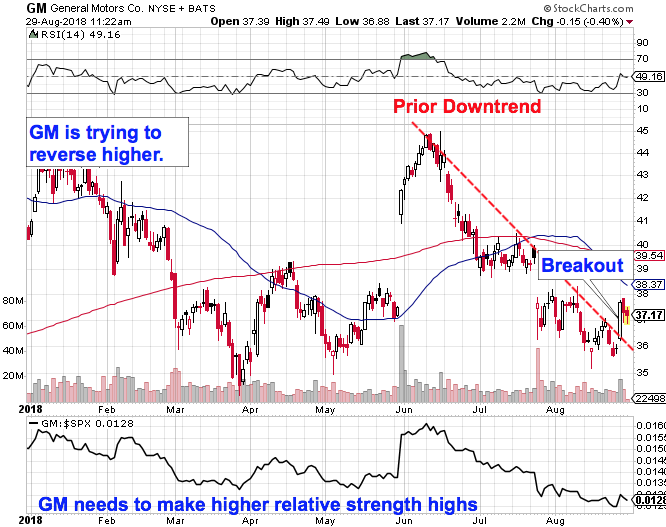 Wait for higher highs in relative strength before buying GM. It's worth noting that all of these U.S. automaker charts are slight variations of one another. In other words, correlations are extremely high in the car industry right now, and macro factors are having a much bigger impact on the price action than company factors. That's true in all cases but one: It should come as no surprise that I'm talking about Tesla Inc. (TSLA . Tesla is also showing off a shallow uptrend in relative strength, which indicates that, in spite of all the drama surrounding this stock in 2018, shares have actually been systematically outperforming the S&P 500 for the last four-and-a-half months. That also jives with the much longer-term technical trajectory in shares. Headline risk is clearly a lot higher in Tesla than its automaker "peers" right now. But that doesn't change the fact that Tesla is the only car company that's in an uptrend in the intermediate term.